For dress shoes, it is desirable to have thin, round shoelaces that look elegant. ? High Quality Wax Coating – If You’re Looking for REALLY THIN Laces to Fit Into Narrow Eyelets These Are It, THE BEST WAY TO FIND THE LENGTH OF SHOELACE YOU NEED: Remove the Current Shoelace From the Shoe, Measure it from Tip to Tip, This is the Length for the New Shoelace – Keeping in Mind to Add or Subtract to Your New Laces if Your Old Laces are too Long or too Short. Many cheap shoelaces use inferior cotton or blends, which causes the laces to wear more quickly or they snap if you pull too heavily. Not so these Lify shoelaces. 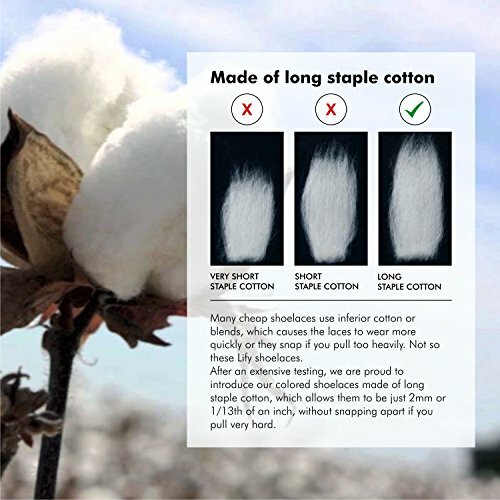 We are proud to introduce our formal round thin shoelaces made of long staple cotton, which allows them to be just 2mm or 1/13th of an inch, without snapping apart if you pull very hard. These Hard To Find Laces Are Thinner Than Your Standard Dress Lace That You’ll Find At Your Local Store. 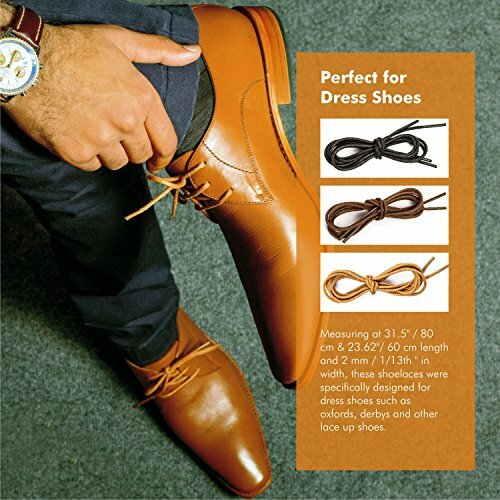 These Waxed EXTRA THIN Dress Round Shoe Laces are High Quality Dress Shoelaces. If You are looking for VERY THIN Laces, These are Extra Thin and High Strength shoelaces, Perfect laces for Dress Shoes with Very Small Holes. These 5 Components make the Laces High Quality: 1) High Quality Wax coating – Stiff. 2) High strength braided construction. 3) Extra Thin – designed for today’s finer dress shoes. 4) Durable sleeve to resist fraying. 5) Added core to increase tenacity. 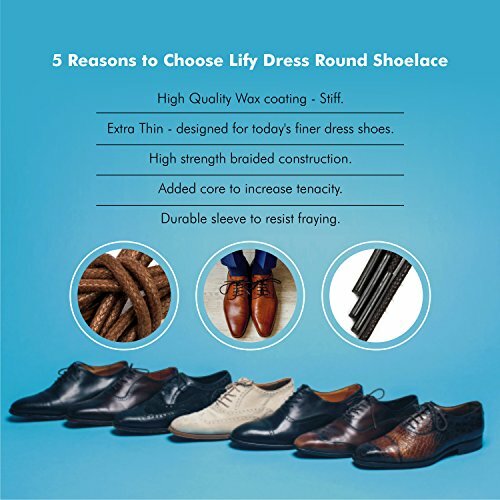 Lify Formal Round laces are high quality dress round shoe laces which are made with the Italian shoe making standards. The Waxed Dress Round Replacement Laces comes in a 3 pair pack (6 Laces). We have 4 colors for you to choose from, “Black, Teak, Tan & Coffee and 2 different lengths to choose from 60CM (23.62″) & 80CM ( 31.5” ) For Sizing info: The best way to find the length of shoelace you need: Remove the current shoelace from the shoe, measure it from tip to tip, This is the length for the new shoelace – keeping in mind to add or subtract to your new laces if your old laces are too long or too short. Made In India.